We know that inflation is the debasement of money by government. The effects of inflation show up in the form of rising prices over time. The rising prices are a reflection of the loss of purchasing power of the currency involved. For our purposes, that means the U.S. dollar. The green columns indicate years during which the prices of goods and services – as represented by the CPI – increased. This is “a reflection of the loss of purchasing power” of the U.S. dollar. The red columns indicate years during which the prices of goods and services declined. The falling prices in those years are “a reflection of the increase in purchasing power of the U.S. dollar”. 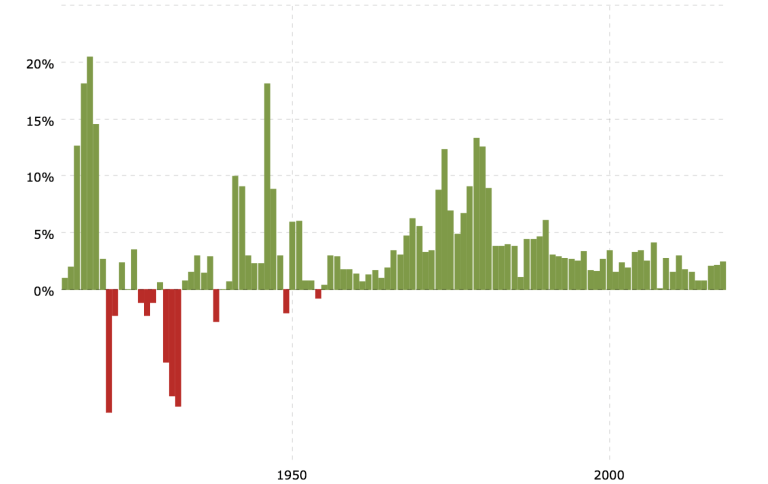 The overwhelming predominance of green years vs red years (red years of significance are 1921-22, 1926-28 1930-32, 1938) indicates an ongoing, long-term decline in the value of the U.S. dollar over many decades. However, the extent of the decline is easily underestimated. The effects are cumulative. And when one learns that the U.S. dollar has lost ninety-eight percent of its purchasing power over the course of the period depicted in the chart above, the gravity of the situation is worsened considerably. How does the government “cause”, or create, inflation? The term government includes central banks. The U.S. Treasury, in conjunction with the Federal Reserve, continually expands the supply of money and credit by issuing Treasury Bonds, Notes, and Bills. The Federal Reserve receives the newly certified Treasury securities and then issues a credit to the U.S. Treasury reflecting the corresponding dollar amount. The U.S. Treasury proceeds to spend the new funds which it has received from the Federal Reserve, and the Fed subsequently places the Treasury securities with certain primary dealers, who, in turn, offer them to investors. The investors include foreign governments, large corporations, and private individuals. But where does the Federal Reserve get the money that it gives to the U.S. government? It is created out of nothing. The money was never there. Yet it was issued to the U.S. Treasury immediately upon receipt of the new Treasury securities. Let’s suppose that you go to your bank. You tell them that you want to borrow one million dollars. Your bank graciously agrees, even though they do not have the money to lend you. You take the money and run…and spend it…all of it…and more. Your bank did not have the money to loan you. But they gave it to you anyway. How? They manufactured it; created it just for you. The offsetting balance for the newly created money is the loan agreement that you signed. When your loan is due, you visit your bank. You sign a new loan agreement for two and one-half million dollars. One million dollars pays off the original loan. The one and one-half million you walk out with takes care of your ordinary one million dollars in expenses plus one-half million dollars in additional expenses you have incurred because of ‘deficit spending’. You are not worried. And neither is your bank. Both of you know that you will continue this activity indefinitely. It is absurd, of course. That’s the point. It is called ‘monetizing the debt’. And it is a perfect example of creating something out of nothing. Which is exactly what happens between the Federal Reserve and the U. S. Treasury. It’s nice to be at the top of the food chain. In looking at the chart above, there appears to be a long-term decline in CPI rates over the course of the entire period (approximately one hundred years). The effects of inflation are ongoing and cumulative but are not as potent as in earlier years. Each succeeding infusion of money into the system has less and less impact. This is due to the fact that each infusion cheapens the value of other money already in the system. This is not entirely dissimilar to the drug addict who finds that it is more difficult to get high with each succeeding fix. Stronger doses are needed just to maintain some type of equilibrium. This is evident in the fact that after the Fed’s herculean efforts ten years ago to extricate us from apparent financial and economic collapse, it seemed that the economy wasn’t responding. If a return to better, or more normal, activity can be effected, it seems to take longer and longer. Deflation occurs when the system can no longer sustain itself on cheap, easy credit. This is indicated by the red years on the chart above. The more aggressive the creation of the credit, the more horribly, destructive are the effects of deflation when it occurs. Deflationis characterized by a contraction in the supply of money and credit accompanied by a decrease in the general price level of goods and services. It is the exact opposite of inflation and its effects are not nearly so subtle as those from the long years of inflation preceding it. Deflation and its crippling effects on economic activity are evident on the chart and were in full force mostly in the 1930s during the Great Depression. Regardless of the Fed’s attempts to avoid it, deflationis a very real possibility. An implosion of the debt pyramid and a destruction of credit would cause a settling of price levels for everything (stocks, real estate, commodities, etc.) worldwide at anywhere from 50-90 percent less than currently. It would translate to a very strong U.S. dollar. And a much lower gold price. Those who hold U.S. dollars would find that their purchasing power had increased. The U.S. dollar would actually buy more, not less. But the supply of U.S. dollars would be significantly less. Of course, this would be accompanied by a complete collapse of any and all forms of real estate, commodities, stocks, etc. – pretty much any asset or item denominated in U.S. dollars. The most severe effects would be felt in the credit markets and in any assets whose value is primarily determined and supported by the supply of credit available. Things would be much worse than what we experienced in 2008-12. The biggest difference would be that the changes would result in depression-like conditions on a scale most of us can’t even imagine. And the depression would likely last for years, maybe even decades. The Federal Reserve, in its current attempt to avoid a complete and total rejection of the U.S. dollar, has been very slowly trying to influence higher interest rates and a return to a more normal credit environment. And, at least at this point, the relative strength in the U.S. dollar over the past several years indicates that they have been moderately successful in those efforts. Unfortunately, the Fed’s efforts are not having the desired impact. And they are in danger of triggering another credit collapse. We are all hooked on the drug of cheap credit. But we are seeing more signs that cheap credit is not buoying economic activity to the extent hoped for. Also, higher interest rates are choking off some of the activity that would normally have been there. Two sectors of the economy that are flashing warning signs related to these concerns are automobiles and real estate. And their actions, especially including the inflation that they create, are disruptive and destructive. Raising interest rates could trigger another credit implosion which could lead to deflation and a full-scale depression. Maintaining low interest rates furthers the dependency on cheap and easy credit. This heightens the risk of overdose and could also lead to a swift and renewed weakening – and hasten the eventual death – of the U.S. dollar. If the Fed emphasizes and proceeds with the liquidation of debt securities on its balance sheet, it could directly usher in severely higher interest rates – unintentionally; and collapse the debt markets. Doing nothing is an option. The problem with that choice is that they are holding a ticking time bomb and don’t know how long it will be until their world blows apart. Regardless of any specific action or inaction by the Fed, we will see a complete and utter destruction of the U.S. dollar at some point. And it is the Federal Reserve and U.S. government who are responsible. Kelsey Williams is the author of two books: INFLATION, WHAT IT IS, WHAT IT ISN’T, AND WHO’S RESPONSIBLE FOR IT and ALL HAIL THE FED! Kelsey Williams is a retired financial professional living in Southern Utah. His website, Kelsey’s Gold Facts, contains self-authored articles written for the purpose of educating others about Gold within an historical context. © 2018 Copyright Kelsey Williams - All Rights Reserved Disclaimer: The above is a matter of opinion provided for general information purposes only and is not intended as investment advice. Information and analysis above are derived from sources and utilising methods believed to be reliable, but we cannot accept responsibility for any losses you may incur as a result of this analysis. Individuals should consult with their personal financial advisors.